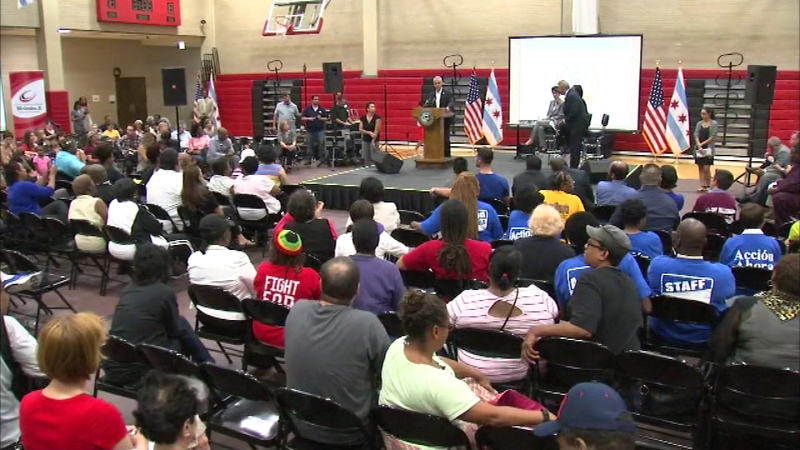 Mayor Rahm Emanuel is responding following a heated forum with Chicago citizens Monday night. CHICAGO (WLS) -- Mayor Rahm Emanuel is responding following a heated forum with Chicago citizens Monday night. Crowds packed into Malcom X College Monday night for their chance to explain their ideas for raising $754 million to balance the city budget. During the meeting the mayor was interrupted by hecklers which created for some tense moments. "I appreciate all the people that came," Emanuel said. "If you agree or disagree, the fact is they have passion for their neighborhood, passion for the community, passion for whatever topic they want to talk about and that makes Chicago better." Two more budget forums will be held this week including Wednesday at the South Shore Cultural Center and Thursday at Wright College.